Before I ever walk into a restaurant, I generally take a quick picture of the front. This way, when people are searching for the place, they have a sense of what it looks like from the outside. However, there are times I get distracted, forget or it just ain't practical to take a picture (like people are staring at me...). This was the case when I met Rich Guy for eats at Sang Thai. While we were eating, I told him to remind me to take a picture before we left. Well, apparently we could give Dory a run-for-her-money in the memory department. We left without doing so! That only meant one thing - I'd have to return. 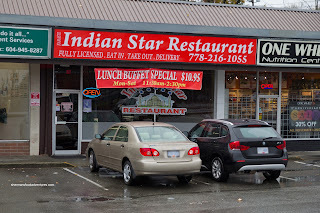 But not to the same restaurant, but across the street at Indian Star. 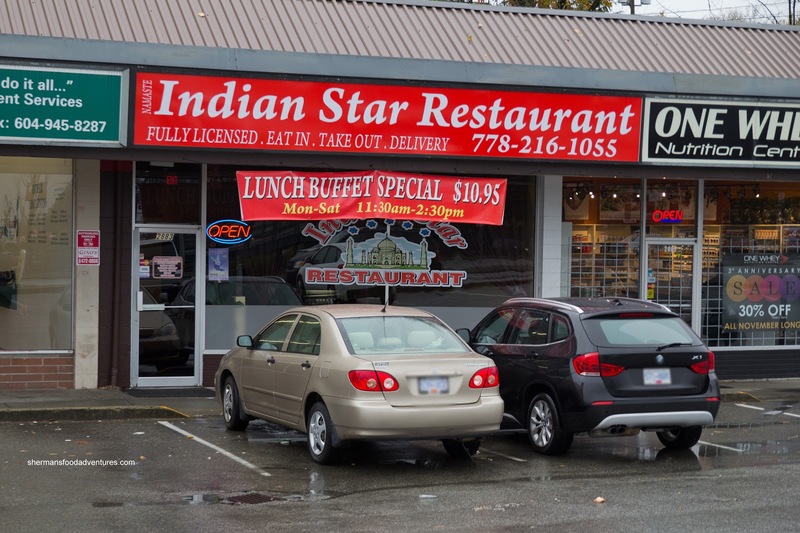 It is kinda ironic because the reason we went to Sang Thai was because we couldn't find Namaste (which became Indian Star). 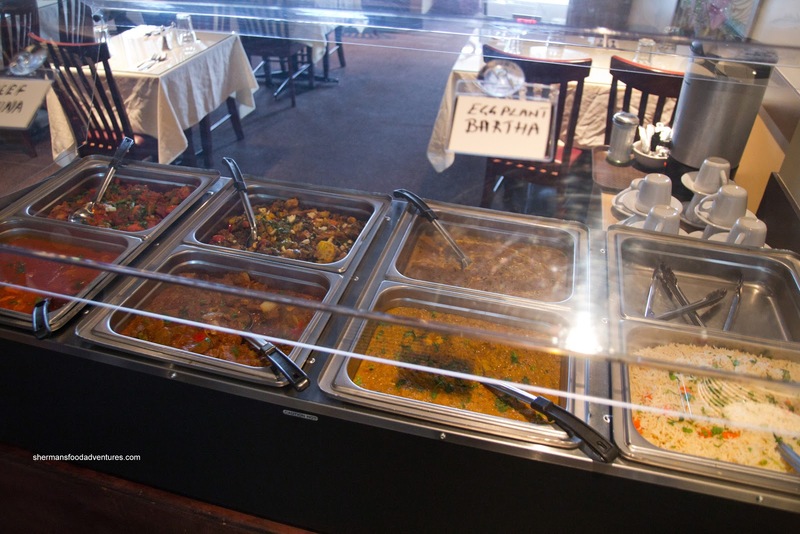 Since we wanted to try a variety of dishes, we went for the lunch buffet at $10.95. There were 2 stations with one being the cold items and the other being the hot. Also, there was a pot of Chai, which was a welcomed compliment for the food. While Rich Guy was helping himself to the salad, I went straight for the hot food. Pffttt... 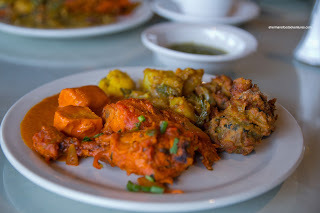 Salad... Anyways, there was Butter Chicken, Beef Curry, Eggplant Bartha, Tandoori Chicken, Mixed Veg, Dal and Pakoras. I gave the Butter Chicken a shot first and it was full of large chunks of breast meat. It was neither too dry nor really moist either. I found the sauce on the tomatoey side with a good helping of sodium. It did have a good consistency though and was somewhat creamy. Next up was the Beef Curry which was mild, yet once again salty. The beef was on the chewier side as well. Despite the salt, the flavours were pleasant though. Moving onto some vegetarian offerings, I had the Eggplant Bartha, which was smooth and also quite mild with a sweet onion finish. (probably intentional as it is a buffet). My only wish for this dish would be more peas. 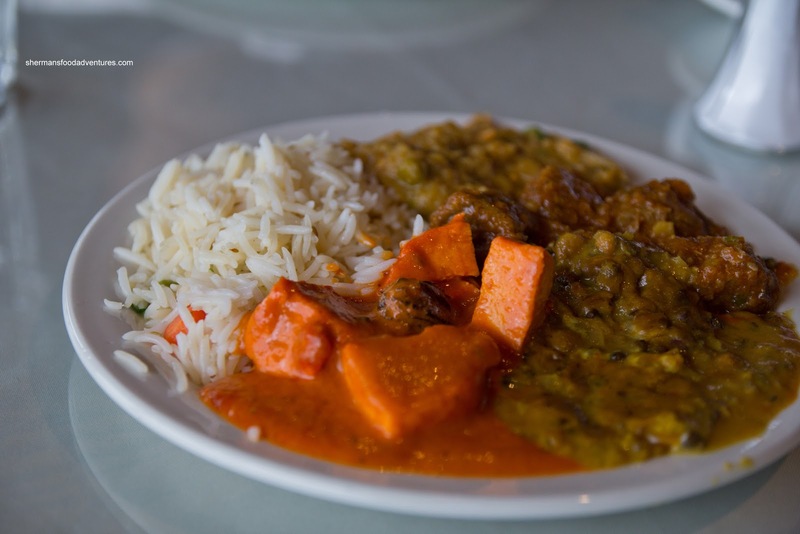 The Dal was equally mild and slightly sweet. It had a nice texture and consistency though. Back to the meats, I tried the Tandoori Chicken and predictably, the dark meat was more moist than the white meat. It was quite flavourful though, yet was missing a good char (the question is... do they have a tandoor on site?). 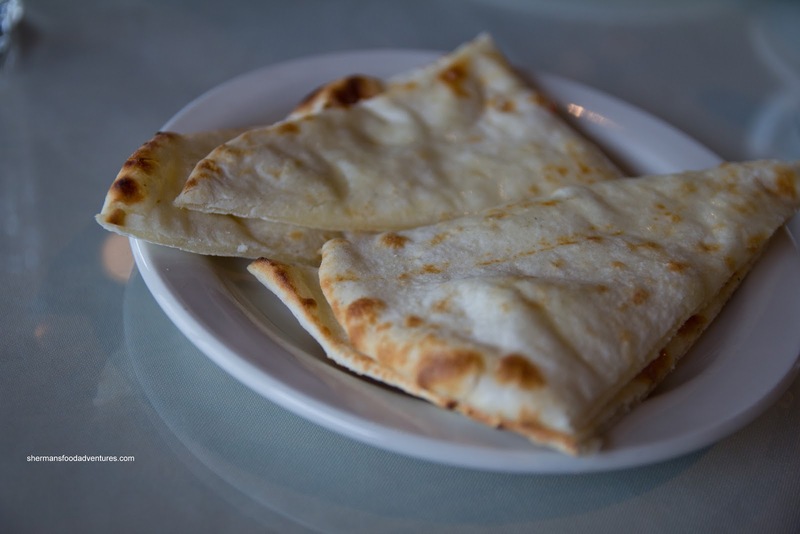 With the arrival of the Naan (served tableside because it would turn hard in the warming tray), from its appearance, we suspected there was no tandoor (or they need to char things more). All-in-all a pleasant enough meal at a reasonable price. On top of that the service was quite attentive and friendly. The only question is: which buffet is better, the one here or The Bombay? That's one of the main complaints I have with Indian buffets .... the foods are overly-salty. Don't quite understand it ..... all the wealth of spices at their disposal, and yet they tend to be heavy-handed with the salt. One buffet (lunch only) place I like which is not salty is New Novelty on Fraser/50 Ave. And they serve you a huge personal basket serving of hot fresh naan from the kitchen, which I love. 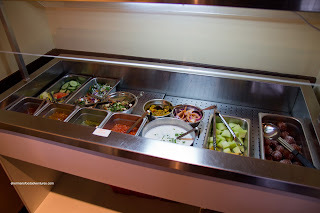 @LR I think they need prepare the food differently for the buffet. It has to keep and have flavour. So maybe I should order off the menu next time. I went with my wife who is Indian descent. She thought it was great and usually she doesn't. I was happy she was happy. It was a great place and the food was great.